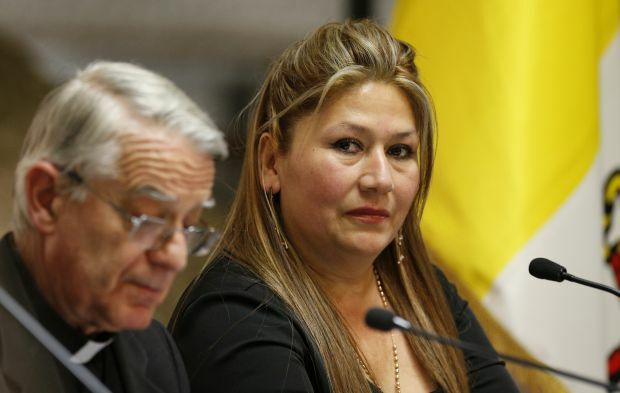 VATICAN CITY (CNS) — People said Floribeth Mora Diaz was crazy to think Blessed John Paul II interceded with God to heal her brain aneurysm, but if so, “then it is a blessed craziness, because I’m healthy,” she told reporters at the Vatican. The 50-year-old Costa Rican woman spoke at a news conference April 24, just three days before she would participate in the Mass for the canonization of Blessed John Paul; Pope Francis accepted her healing as the miracle needed for the late pope’s canonization. At the same news conference, Daughter of Charity Sister Adele Labianca gave her eyewitness account of the healing of Sister Caterina Capitani, the nun whose healing in 1966 was accepted as the miracle needed for the beatification of Blessed John XXIII. Pope Francis waived the requirement of another miracle for his canonization. Even though both women have told their stories hundreds of times, they were emotional before an international gathering of reporters at the Vatican. Sister Labianca said she had to read her testimony from a prepared text because she was certain she would forget something. Mora Diaz simply let her voice tremble. The Costa Rican woman, who traveled to the Vatican with her husband and four children, told about having a severe headache in April 2011, going to the doctor and being told she had a brain aneurysm. The doctors in Costa Rica said surgery might be able to help, but she would have to go to Mexico or Cuba for the operation, and she did not have the money. The local doctors could do nothing more for her, so they sent her home, “telling me I had only a month to live.” She began crying as she talked about her husband trying to prepare their children for their mother’s death and urging them to pray. After months of treatment, doctors removed most of her stomach, which was covered with tumors, and her entire spleen and pancreas. At first she improved, but then she developed an external fistula, which leaked, Sister Labianca said. She was on the point of death May 22, 1966, when the assistant provincial of the Daughters of Charity brought her a relic, reportedly a piece of Pope John’s bed sheet. “Frightened to hear a man’s voice” in her room, she turned and saw Pope John standing by her bed. He told her she was fine, and she went to tell the other sisters that she was healed and hungry, Sister Labianca said. With the acceptance of her healing as a miracle, Pope John Paul beatified Pope John in 2001, and Sister Capitani was there. She died in 2010, more than 43 years after she was healed.